We gotta talk about this meal that I am L.O.V.I.N.G. But first, name that movie. And second, did you have a wonderful weekend? It was kind of warm here! We dyed easter eggs. We wore bow ties. We ate TEN THOUSAND POUNDS OF CHOCOLATE. Oh my gosh. The chocolate. It needs to end. I am over.it. I am done. I am done, I say. Now please just remind me of that tonight at like 9:54PM. That seems to be my crashing moment. But now, the meal. Nooooooodles. Noodly noodles. 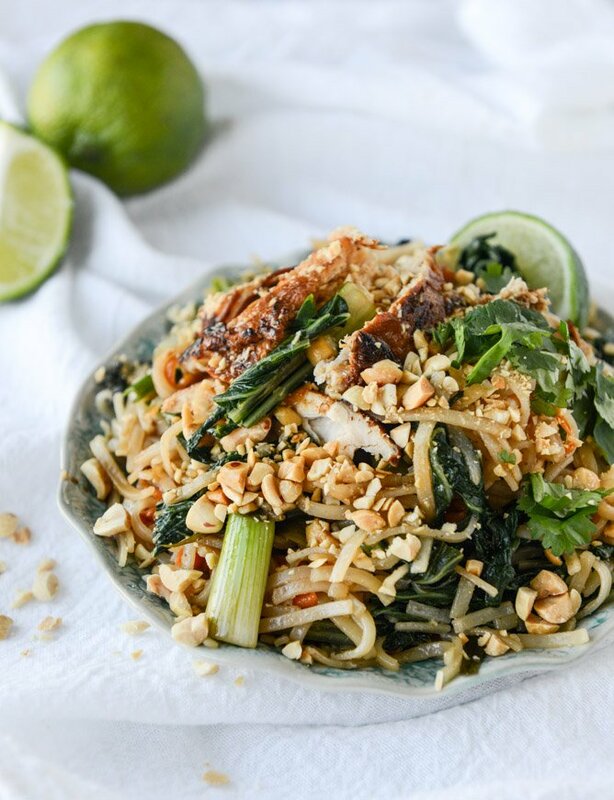 These noodles are based on some of my favorites from noodlehead here in Pittsburgh, which is essentially my Thai food heaven. IT IS SO DELICIOUS. So if I’m being real, I desperately wanted to recreate their Thai fried chicken street noodles. It’s my fave. FAVE. The chicken would be fried and spicy and piled high on the noodles. It would be crunchy and crispy and look just like this, but on noodles. I made it once. It was a CHALLENGE. It took a lot of time; it wasn’t completely ideal for a weeknight meal. It was nearly impossible for me at the moment with a baby, but even without a baby, my go-to weeknight meals are fairly quick and easy and not dependent on a saucepot of scalding oil. So. I tried the chicken a different way. A more weeknight-friendly way, busy life-friendly way, if you will. My inspiration was this chipotle chicken bowl. 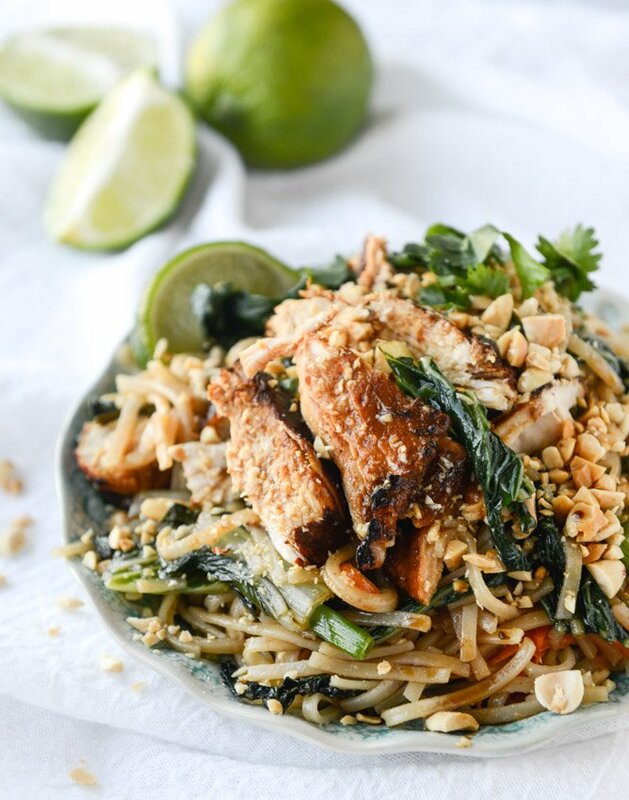 But also this crunchy Thai chicken salad! And the Thai chicken lettuce wraps in Seriously Delish. I mish mashed those recipes together and came out with something totally fabulous and worthy of a BIT of extra time on a random Tuesday night, but not a full two hours. Also: Swim suits. Swim suits swim suits swim suits. No one wants to eat fried chicken and then have to walk through the swim suit aisle at Target (because, of course, it’s in the front of everything) to go buy shampoo, crackers, three cases of la croix, a floral notebook, thank you cards on clearance, polka dot paper straws, foaming hand soap and the newest flavor of burt’s bees lip balm. I’m not going to go and say OMG these are super authentic and claim them to be perfect, but I will say that they taste like some of my favorite noodle dishes, heavy on the peanuts. Heavy on the peanuts, always. Heavy on the lime and cilantro and Thai basil too. Uh, plus? There is some green stuff in here! And you don’t NEED chicken – you can do a mix of veggies or some shrimp or maybe some tofu. Also, if you want to be best friends you definitely CAN fry that chicken. You’ll be my hero. The night before or an hour or two before making, marinate the chicken. Use a meat tenderizer to pound it out a bit and make the breasts slightly thinner. Season it with the salt and pepper, then whisk the remaining ingredients together. Pour them over the chicken and refrigerate until ready to use. If you’d like the bok choy greens to stay bright green, you can blanch them. This isn’t mandatory for the recipe to taste good, but it does make it prettier: bring a pot of salted water to a boil and add the greens. Cook for 1 to 2 minutes until they are bright green, then remove the greens with tongs and drop them into a boil of ice water. Cook the rice noodles according to their directions – usually about 5 minutes in boiling water. If the noodles finished before you’re ready to use them, keep them in cold water. Heat a large skillet or wok over medium-high heat and add the chicken – do not add the excess marinade. Cook until deeply golden on both sides and cooked through, about 5 to 6 minutes per side. Remove the chicken and set it aside until ready to use. Using the same skillet, keep the heat low. Add in the coconut milk, chili sauce, vinegar, sugar and garlic, whisking to combine. Increase the heat to medium-low and cook until it thickens slightly, stirring, about 5 minutes. Add in the noodles, boy choy, green onions, cilantro and basil, tossing well with tongs to coat. Toss and toss over again! Slice or shred the chicken and add it in along with the peanuts. Drizzle with the toasted sesame oil. Toss again. Serve immediately with extra cilantro, peanuts and a lime wedge. Man I’m really all about the exclamation points today. Ahh I looooove noodlehead! Like was just there yesterday and plan on going back this weekend love it. Definitely going to need to try this..looks amazinggg! I just had to comment — I made this tonight and it was single-handedly one of the most delicious things I’ve EVER made in my kitchen. 10x better than anything I’ve had at a restaurant. Thank you so, so much for taking the time to develop recipes like this. It was so fun to prep, make, and devour. Thank you! So good! Can definitely see this fulfilling any Thai take-out needs. Just wish I had doubled the recipe so we could have leftovers! Made this the other night with a bunch of random leftover CSA greens — it was one of the best things I’ve ever made! I used the marinade on tofu instead of chicken and it was lick-the-bowl good. Thank you! Seriously delicious! I added some edamame to the mix and it added a nice crunch…even great the next day. YUM! 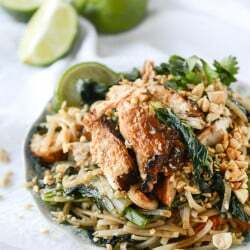 Made these for dinner last night- I had to leave out the Thai basil, green onions, and sugar because we were out, and I doubled everything – this was so tasty and pretty easy too! I love all the flavors! Definitely going in our rotation! Planning to make this tonight, but I’m a little unsure of how to use the bok choy since I’ve never cooked with it before. Do I cut the greens from the stalk and use just the greens, or use both the greens and the stalk? Your photos look like they include both, but I don’t see anything about what to do with the stalk. Do I need to boil/steam/saute it to soften it at all? Looking forward to this…thanks! I was curious about the same thing. And this is regular bok choy not baby, correct? This is a family favorite, thank you so much! I forgot to make the marinade so I made it and just cooked the chicken in it and it was still good. I added a tablespoon of peanut butter and a couple of eggs it was even better. I am too lazy to do anything with the bok choy other than chop up the green parts and throw it in without blanching it and it doesn’t’ make any difference with the taste. I think this recipe is just as good or better than take out! I realize this post is older, but I have made this dish for the last few years and LOVE IT! It is absolutely one of my favorites and one that I constantly reach for. It has totally spoiled me though because I love these noodles more than most thai noodle dishes at restaurants now.